L.A.D.I.E.S. Brunch Conference 2017 – Saturday, October 7 feat. Kelly Parker! August 5, 2017 melvingaines1 Comment on L.A.D.I.E.S. Brunch Conference 2017 – Saturday, October 7 feat. Kelly Parker! Ladies, join us for our third annual L.A.D.I.E.S. Brunch Conference (Living as Devoted in Every Sense)! 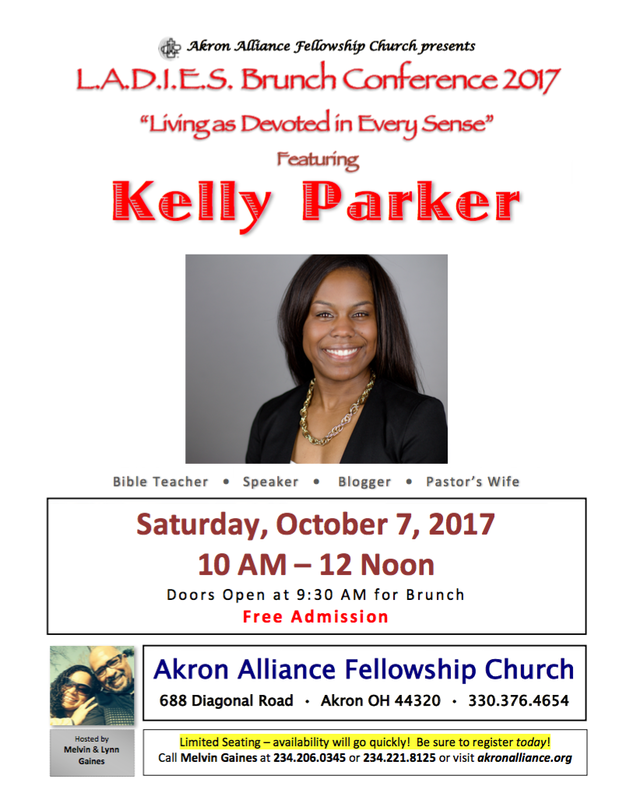 Saturday, October 7, 2017 will be a great morning of inspiration and encouragement with our special guest speaker, Kelly D. Parker. Kelly Parker is a Bible teacher, speaker and blogger. Her desire is to see women embrace the victory and freedom that come from a life wholly submitted to Christ. She finds great joy in conveying biblical truths in a straightforward way to help women apply God’s Word to their everyday lives. Kelly is the founder of When the Gals Gather, a movement focused on empowering women with tools and resources for authentic biblical living. Kelly is a native of Cleveland, Ohio and a graduate of Kent State University. She holds a degree in Marketing and Public Relations and has more than 10 years of professional marketing experience. In her spare time, Kelly enjoys writing, reading and calligraphy. She is married to Luvirt Parker, Lead Pastor of Christ Community Church in University Heights, Ohio. They have three children, Gabrielle, Marcus and Nia, and reside in Shaker Heights, Ohio. Ms. Parker is a wonderful, dynamic speaker who has a message for ladies of all ages! Feel free to invite your daughters, neighbors and friends to this event! Along with a delicious brunch, admission is FREE for this “can’t miss” event, and there will be door prizes, too! If you or a group are interested in attending, let us know as soon as possible (we need a head count!). Please call our church office at 330.376.4654 or call Melvin Gaines at 234.206.0345 or 234.221.8125. I’m not finding where to register for this event. Please consider this as my registration. Thank you. Teresa Scott 330-431-2714.